If you didn't notice the G.O.T.C.H.A in my April Fools Day posting, you can relax. The U.N. is not taxing the Internet. Dozens of people posted their reactions... some angry, some relieved, but most amused. One common thread in the comments was that even though they got the joke, many thought it *could* happen. Landlines on life support? Major telephone companies have asked the FCC to pull the plug on traditional landline service, and an FCC advisory committee agrees. Telcos don’t want to maintain the vast Public Switched Telephone Network for the 25% of customers who use it. Jose Muñoz can tell his parents that all the time he spent playing video games wasn't a waste, after all. His online gaming helped him remain in the U.S. despite being the child of undocumented immigrants. He was able to use his Xbox Live account records to prove he has been in the country continuously since at least 2007. The “anonymized” location data that smartphone carriers and apps gather may not be so anonymous. A team of researchers found they could identify 95% of users from the anonymized dataset by analyzing geo-location patterns, and correlating with public records. The massive denial-of-service attack against Spamhaus (an anti-spam blacklist) that nearly destroyed the entire Internet last week did not happen, according to the Internet Traffic Report. It seems the media fell for a PR stunt launched by CloudFlare, an anti-DoS (denial-of-service) company. Email traffic plunged 9.5% between 2010 and 2012 and is expected to continue dwindling, according to researchers at Radicati Group. Texting, Twitter and Facebook messaging are gaining in popularity because they "replicate the more natural flow of a conversation" and there's less of a problem with spam in those venues. The first sci-fi novel about a cyborg, “The Clockwork Man,” was written in 1923 by E. V. Odies. It is now being serialized online, where you can read it for free. T-mobile will offer the iPhone under a new no-contract plan starting April 12, 2013. The deal is $99 down, then $20/month for 24 months on top of prepaid data plan charges. Alternatively, you can pay list price for the phone and skip the $20 payments. “Google is an agency of the government,” argued defense attorney Lawrence Delay in an attempt to invalidate a search warrant. He hopes to prove that because Google Earth’s images come from satellites launched by the government, they cannot be used to establish probable cause for a search warrant. A judge will rule on this issue May 8. Ever wonder (or remember) what the Internet was like in 1995? This vintage 27-minute episode of The Computer Chronicles captures the good old days of FTP sites, the Mosaic Web browser, Usenet, and e-commerce without credit card security software, at dialup speeds. Apple has banished “Sweatshop HD” from its App Store, apparently telling the developer that Apple is “uncomfortable” with a game that highlights the lives of exploited workers. Apple has also banned a World War II game because it featured Japanese enemies. Walmart is pondering crowd-sourcing for deliveries of online orders. In-store customers would be paid store credits equivalent to gas money for delivering orders to online customers who live along their routes home. I predict a lot of flatscreen TV's will get "lost" during delivery. Most recent comments on "Geekly Update - 03 April 2013"
Greedy telcos! They just want to be able to charge even higher rates for service. For many telephone users, there are specific needs for having a landline. Most home security systems require a landline to operate properly. What about 911 service and the need to instantly know an exact location? Many areas don't get a reliable cell phone signal (mine included) and there are lots of areas that don't meet the requirements for VoIP. I think things are the same in the USA as the UK and base this comment on that assumption. Taking payment for a delivery (even goods or credit is payment) constitutes 'For Hire or Reward'. This invalidates insurance cover. Driving without insurance is a serious Criminal offence and 'Ignorance of the Law is no defence in the eyes of the Law'. I don't think that even Walmart could get insurance for unspecified vehicles with unspecified drivers on unspecified journeys with unspecified goods, at any price. I first thought the prediction of the end of landline telephone service was another "GOTCHA". But when I read the linked Des Moines Register article I realized this was a serious proposal. Removal of landline service will cause great hardship for the elderly and technically challenged persons. In addition, statistics showing many homes have both landline and wireless phone service ignore the fact that many wireless phones are owned and used by the younger generation, people that eventually (hopefully!) will leave the nest! Those wireless phones will leave with them. I suspect there are ways to trim costs of landline service without eliminating it. As a mathematician, I wonder how you calculated that this article makes me 146% smarter? Smarter guys want to know! Perhaps the landline can't be ended as it remains a legal part of national defense and government (no matter who owns the wire). Is it? Dumping the elderly is cold. Are those who advocate change going to come up with a phone that feels and works exactly the same as a landline model - change is something some elderly can no longer manage. 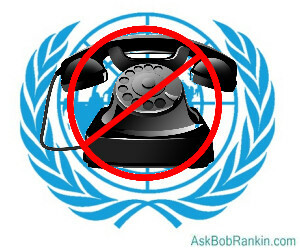 I think it would it would be a really bad idea to eliminate landline phones. People still rely on them for connections to certain services, like home alarm systems already mentioned above. As mentioned in a previous article that you did on them, I still have mine and it is the only reliable service that I have when the power goes out in a severe storm in my area. So the telcos expect all homes, businesses and government to use wireless or VoIP? What about the requirement (where I lived at least) that schools have an analog line to dial 911 if the power went out? As to cloudfire, I read about that and spamhaus was the subject of a dodos that cloudfire stopped. I didn't read any reports of it taking down the Internet. The reports I read we're concerning mail services not being able to get themselves off the blacklist. There is another big expense associated with traditional landlines that the telcos would happily be rid of. Each and every old-school landline phone is powered by the phone line itself. The telcos have to buy or generate electricity to power them. That's a big reason they're pushing fiber-optic land-lines. The plus side for customers with the old system is that during power failures, the phone will frequently keep working. With fiber optic (FO) or VoIP systems, the phone dies when the power does (or when the back-up battery does). I could get along without a landline, almost all of the time. My elderly mother couldn't. Verizon sold her on a FO connection a couple of years ago (I did warn her about this issue) and since then, we've had several storms that have knocked power out for longer than the generous almost-a-whole-day that the back-up battery holds out. My girlfriend possibly could do without a landline but refuses to. Her argument is bolstered by the fact that during and after hurricane (or whatever the heck it was by the time it hit the NY metro area) Sandy and the winter storm which followed it, she was without power for a total of almost 2 weeks (not all of it in a row)-- and never lost landline phone service. With regards to the telephone land lines being discontinued and replaced solely with cell phones and wireless devices; when there is a major power outage, storm, or communication towers are damaged or destroyed, wireless/cell phones are useless. Without the towers to bounce the signals, cell phones are dead. Land line phones will still work during a power outage. Anyone recall a novel from years ago called: Prophet Blind. All the communication satelites were destroyed by a rogue satelite that roamed around from one to the other until there was only one left; Prophet. The last message send from it was Prophet Blind. It was a fictional story about becoming overly dependent on technology and wireless devices. All of the land lines and underwater cables had been disconnected. I agree with Byron M's comment. There is still a need for landline phones. Where I live, we have a lot of power surges and power outages during severe weather. I need my landline in order to make calls. This is just another way for the major telecoms to make even more $$$$$$ off of us, for using our smartphones.